Stems: Stems ascending to erect, simple to much-branched, glabrous; nodes without paired spines. Leaves: Cauline, alternate; long-petiolate; blade lanceolate to elliptic or ovate, .4 to 4 inches long, .4 to 1.4 inch wide, base acute to rounded, margins entire, tip obtuse to short-acuminate, surfaces glabrous. Inflorescences: Panicles, terminal, often long and slender, usually also with axillary spikes; bracts 3, ovate, distinctly longer than tepals, 1/6 to 1/4 inch, apex long-acuminate to subulate. Flowers: Staminate flowers: tepals 5, unequal, lanceolate to oblong-elliptic, outer ones ca. 1/6 inch, apex awn-like, inner ones 1/10 to 1/8 inch, apex acuminate or notched and awn-like; stamens 5. Pistillate flowers: tepals 5, unequal, oblanceolate to spatulate, outer ones 1/8 to 1/6 inch, awn-like, inner ones 1/12 to 1/8 inch, rounded or acute; stigmas 2(-3). Fruits: Utricles .06 to .08 inch; seeds black, biconvex, .04 to .05 inch. Habitat: Sandy fields, river and stream floodplains, roadsides, and waste places. Uses: Native Americans in the Southwest rolled the cooked plants into a ball that was baked and stored for future use and would sun dry the seeds and grind them for food. Comments: Plants dioecious. 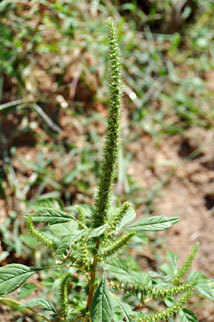 Amaranthus, unfading, alluding to the persistent bracts and tepals. Named for Edward Palmer, British-born botanist.